I headed to Sprouts to get a few things: the berries that were on sale (3 or 4 for $5), lemons and ginger (because I’m sick), grapefruit that were 50 cents each (not sure that’s great, but whatever), mushrooms and spinach because those are like staples here. They had other great things on sale, like red bell peppers for 50 cents, but I’ll wait until we use up the 6-pack we have. Also: the cornstarch. We’re set for milk and cheese, but eggs are down to less than a dozen. I don’t pay Sprouts prices on eggs, so we’ll see how long I can hold out before we need more. I ended up spending about $20-something dollars at Sprouts. I need to check the receipt since I also bought some homeopathic cold remedies, too. Those don’t count towards the grocery budget. From the freezer: we’ve used up cooked steel cut oats for my breakfast and two loaves of marked down breads that I served for lunch today. From the fridge: lots of leftovers. I think that with tonight’s pot pie, we’ve eliminated most, if not all of the leftovers. I think I’ll be ready to do an inventory. From the cupboards: various half-eaten boxes of crackers, crispy rice cereal. Lunch: For those away from home – leftover Bolognese and Spaghetti Squash from Saturday dinner or leftover pot roast from last night. For those at home: Stone Soup and bread from the freezer. Dinner: Date night for the parents; Beef Pot Pie made with last night’s leftover pot roast for the kids; Stone Soup for the kid who doesn’t like Pot Roast. I feel like I am making progress On the fresh stuff languishing in the fridge from the attack of the crud. I think I will still be tossing more but am grateful to be saving what I can. Jessica. hope you are feeling better! Breakfast-after going to the gym (another goal for this year) I had an egg white feta spinach wrap at Starbucks with a gift card. Plus it was double star day. Dinner-rotisserie chicken (I get them from Costco, cut in half, then freeze with my foodsaver. Works great for the two of us), rice and spinach salad. I booked out meals for the whole month with alternates. Feeling pretty proud of myself! Looks like I will only have to buy lettuce this month if all goes according to plan. S – beef vegetable soup with French bread..
We had some leftover roast beef and the juices from said roast beef in the freezer. Used some of the beef and all of the juices, a handful of lentis, with onions, carrots,peas, green beans and chopped spinach from the freezer, celery and mushrooms from the fridge and a can a muxed beans to make a big pot of soup. I also made a batch of French bread -2 loaves and a couple of buns to round out supper. The buns quickly disappeared at lunchtime but one full loaf plus part of the second made it to the freezer. Lots of extra soup as well. Used lots of odds and ends and we were well fed. I really want to re-org the outside freezer but with the temps right now being almost the same outside the freezer as they are inside, I think I might wait until next week when the daytime temps are supposed to be much warmer. Breakfast: yesterday’s leftover chicken and gravy, with a biscuit and coffee. Hubs had cereal. Lunch: ham sandwich for hubs, chicken and cheese pita, cukes and hummus, blackberries, nuts and pretzels for me. B: Oats and milk for DH. Oatmeal and milk for DD1. Branflakes for DD2. HM roll and coffee for me. L: Packed lunch for DH and DD1. Rye bread with fish and leftover roast for DD2 and me. Veggies on the side. Afternoon snack before DD1’s gymnastics class: WW crisp bread with butter. D: Crêpes for kids and bruschetta for the adults. Oh wow that “pizza” sounds amazing! What a great use of odds and ends! D – Last of the leftover Salisbury steak, roasted potatoes, carrots, tomatoes, and onions. I also took a bag of cooked zucchini from the freezer that I made with tomato sauce, onions and garlic a few weeks ago and served that as well. One more bag left. I had to do a fridge run too, we haven’t bought produce since before Xmas. I went to aldi, but I’ll have to do a Kroger run today because aldi doesn’t carry a couple of things we need, and I forgot carrots-something my kids are devouring lately. I’m going with it! 1/3- Kids first day back to school! D-I had pulled 2 large chicken breasts* from the freezer and tossed them into the crock pot with a jar of salsa*, served with brown rice, seasoned black beans, canned corn and made homemade corn cake*. Had enough leftover to create 2 bowls- 1 for me to take to work and 1 for husband to eat(works from home).. Love no leftovers! *using up stuff I have had in the pantry or have surplus of. I cleaned out one of the cupboards! I discovered about 6 kinds of nuts in tiny amounts leftover from baking so I’m going to make granola today. Breakfast: oatmeal for some, bagels for some. Dinner: cheeseburgers from the freezer, freezer applesauce, spinach and apple salad. I’m plotting out the next couple weeks which includes a visit from my dad who is allergic to nuts, legumes, wheat, soy, and a few fruits so that will likely involve some shopping! Breakfast: I had a turkey and avocado sandwich (I’m trying to use the avocados up before they go bad). Nick ate at work. Lunch: I had a salad with turkey and avocado. Nick had McDonald’s (apparently work was busy). Dinner: Potato soup and beer bread (a homemade mix my sister gave us at Christmas). It’s just too cold right now to think about making anything but soup! I typically don’t know what my husband eats for breakfast and he sleeps through lunch (overnight worker), but I’ll share the ones I know. Kid 2 – Not sure. The kids had a delay and my husband was actually home, so he took care of it. Me – Leftover soup. This soup is a kind of stuffed pepper soup, but was made using all the leftovers in the refrigerator, so it was only a small amount of old red and yellow pepper, turkey burger, and cauliflower rice from a head of cauliflower that was going bad. I also purchased a TON of black berries from Aldi’s when they were $0.85, so I will have those and some almonds for lunch. Dinner – Taco night. Husband and 2 kids will probably also eat french fries. Muffins in the oven now using the last of some blueberry muffin mix, the leftover yogurt and some apple juice. I don’t know how old the bulk muffin mix was, but if it is a fail, the chickens will have it for breakfast. I thawed out a quart container of chicken and broth. Using the chicken for roll-up sandwiches with the last of the lettace and the last of some ranch dip. The broth will be used in stuffing I cubed up all of the leftover rolls from Christmas. I’m in, finally. Glad to see familiar and new names. We just got back from vacation last night and my DD now has a stomach bug. Glad we made it home before it kicked in and hoping the other four of us stay healthy. My goals are to work on the fridge and freezers (they need a lot of work). The pantry is in okay shape, but I’ll work on that, too. I really need to get rid of old items. Taking it slow today with a freezer meal for dinner and snacky lunch. Need to get some fresh items from the store, either tonight or tomorrow. We only grabbed milk on the way home last night, but already have crackers and applesauce for anyone that’s sick. January will get VERY busy once the kids are back at school on Monday, so I really need to stay on top of the planning and prepping. We now have chickens that just started laying a month ago. We are getting about 11 eggs a day. It did slow with our extremely low temps until we put a lamp in there coop. We only use the lamp with freezing weather though. 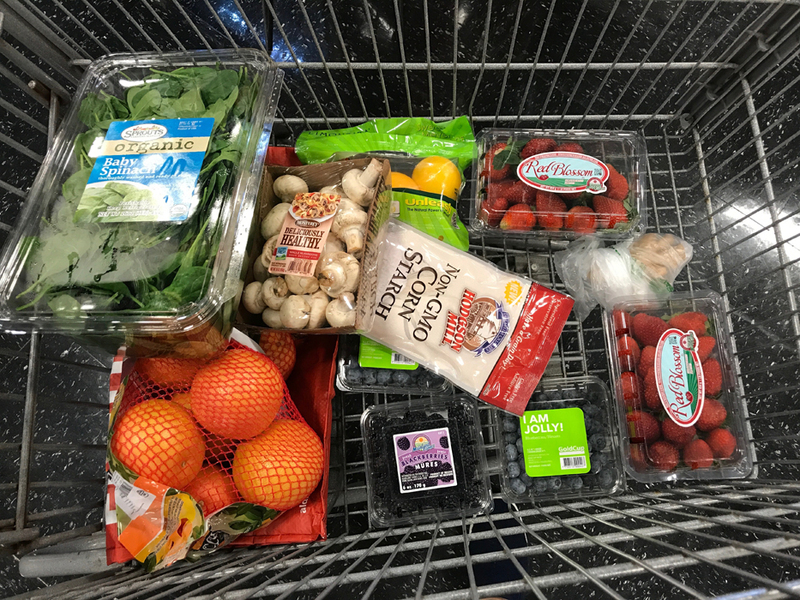 Small shopping trip – iceberg lettuce, spring salad mix, small tomatoes and a bag of orchard valley harvest chocolate covered blueberries for hubs, his fave. The pot pie used a pack of whole wheat pie crust I found on clearance that were languishing in the freezer, a can of chicken from a sleeve of them from Sam’s that I need to use up and was a warm meal in this frigid weather! Yikes! How scary for your hubs. Glad to hear he’s ok though. Thanks Roberta – it scared him really bad. He was just regaining his composure when I got home. He was hoarse for the rest of the day. So, when alone, always be careful eating. Wednesday, January 4, also my daughter’s last full day with us for now. D: we went to a new bbq restaurant that opened up the street- it’s been highly anticipated, as its parent restaurant is beloved, super good, and very well-respected around here. It was good and surprisingly well-prIced. We have leftovers, including some of the best Mac and cheese I’ve ever had. D- Italian Sausage Pie- I have a few frozen pie crusts that weren’t used over the holidays so between the one of the crusts and the 3rd package of Italian sausage (4 packages from Costco) and cream, eggs cheese and a half of onion dinner was served. It was very good and the other half will be eaten tomorrow. Too full for any snacks! L: Hubs ate a salad at work. Son had some friends over, and they had PB/apple butter sandwiches (hm apple butter and hm ww bread), grapes, orange slices (our tree), and hm ginger snaps. (Yesterday would have been my dad’s 88th birthday, and ginger snaps were his favorite cookie so I made them in honor of him. Didn’t truly need any more sweets in the house, but who cares?) I had a slice of PB toast and a ginger snap. D: Homemade pepperoni and olive pizza (pantry and fridge), salad, carrot and celery sticks w/ hm ranch dip, grapes. S/D: Candy (for the kids), grapes, pumpkin roll (gift). I need to pick up a few things at Sam’s and Sprouts today. I’m hoping I can stick to my list. Will report back tomorrow. That’s sweet about the cookies and your dad – I would’ve made them too! Lunch – made 4 chick pea burgers for lunch this week, served on a sandwich thin with shred lettuce and ketchup. I had cooked dried chick peas last week and had 12 oz leftover in the fridge! Dinner – cooked two turkey legs in the crock pot and then deboned them. Took the bare-naked legs and returned them to the crock pot, covered with water and vegs scraps. This morning I had a jar and half of fantastic turkey stock! Lunch – chick pea burger on a sandwich thin with shred lettuce and ketchup. Dinner – I had bought a boneless pork loin at Kroger for 0.99/lb before Christmas. Cut it in half. Used half in the crock pot for dinner tonight with apples, onions, honey and cinnamon. Tastes great! The other half is now in the freezer. It’s so cold today here in GA that I’m staying home all day. I cooked up my Halloween pumpkin in the microwave (finally!) which has been staying cold in the garage since OCT!!!! I have five 15 oz Ziploc bags of pumpkin puree for the freezer. Figured I just saved myself $4.96 by not tossing that pumpkin and making my own puree for baking. And this is why my freezer fills up, ladies! Right there with you Felicia and Melissa. This NC girl stayed in all day today too. SO cold but we did get about 4-5 inches of snow . We had really strong winds. We always have wind, but had gusts of 50+ mph. Due to the wind and the weight of the snow, we lost 5-6 trees:( This tree damage is worse than past hurricanes. And Felicia, I feel your pain. I took some broth and other ingredients out of the freezer to make soup and now the leftovers will go back into the freezer! The continuous cycle! Heather, our daughter lives in Arlington so I always keep an eye on the temps in the DC area. Definitely colder there. Our daughter had to trade in her flip flops for boots and puffy coats when she re-located there. I’m with you re: farther north. Brrrr. I can’t imagine either and I sure don’t want to experience it! Our schools went back Tues and we had a two hour start delay that day, a 3 hour early dismissal yesterday and out today and tomorrow. An extended Christmas break! Talking about a small world, my niece is leaving January 8 to spend a year as an au pair in – you guessed it – Arlington! We’ll miss her, but I am so happy that she has this opportunity. Well, my goodness. All roads are leading to Arlington in this thread-even from Denmark! How about that! My daughter has really enjoyed being there. She’s in Clarenden and it’s so convenient. She can walk to anything she needs, including her work. Sounds like time for some Pumpkin Soup and Pumpkin Bread! I’m shocked that it lasted so long. Lunch parmesan chicken strips made with half a chicken breast with a whole bird I thawed out, homemade stuffing and cranberry apple salad. I boned out the rest of the chicken. Set aside the leg quarters, and the other breast. Put the carcass, all skin and wings into the pressure cooker. Boned out the results and fed the skin and scraps to the dog. Meat and broth are ready for chicken soup. I’ve thawed out a pint container of red beans to make refried beans. Breakfast -chocolate protein shake and tea for me. Hubby had cinnamon oatmeal. Says trying to be healthy so wants to eat oatmeal everyday now. Boys -eat on their own. Lunch- a piece of lasagna for me. Hubby ate at work. Oldest son ate at Arbys after a Dr appt. #2son ate the last of the lasagna and chex mix. Supper- cheesy hashbrown casserole with polish sausage in it. Steamed broccoli. Dessert: Christmas candy – there is a lot of it !! January 4-Snow Day! Funny how it only takes 2 inches in VA for things to shut down completely. Bfast/brunch for kids- Leftover pancakes, bacon and egg for one kid. Me- waffles from freezer, bacon. Lunch-Me- vegetable beef soup from freezer, toasted rolls from freezer. Dinner- Leftover lasagna soup for husband and kids, Me- Leftover beef, leftover mashed potatoes, cheesy rice from a free packet from Kroger. Made zucchini muffins with one pack of zucchini from the freezer. Only one pack left from summer. Hello everyone! I am so happy to be back in pantry challenge mode. I still have so much in my freezers that if I buy any meat this month someone needs to slap me! I am also ready to get back to eating homemade food that is relatively good for us. We have been eating way to many sweets and with out of town company over the holidays we went out to eat alot. We are a two person household now, We stopped doing foster care Nov 1st and our 18yr old adopted son was sent to Boystown for not complying with a court order so it is just my husband and I. Learning to cook for two has been challenging to say the least but we are getting a handle on it. Breakfast–husband had an omelet with chicken, mushrooms, onions and broccoli. a bagel and a cutie. I wroked so I didn’t eat. Lunch was the last of the cheese and crackers from Christmas with summer sausage from the freezer, sliced apples and carrot sticks. Dinner–I cooked 3 pieces of salmon, 2 strip steaks and 2 Zaycon chicken strips and made roasted sweet potatoes and russet potatoes and green beans and asparagus. I had steak, russet potatoes and some of the veggies and he ate salmon, sweet potatoes and veggies. Breakfast–Husband had oatmeal with cinnamon and applesauce, a bagel and a yogurt and I had peanut butter toast. Dinner–L/o pot roast, mashed potatoes and gravy and carrots mixed with onions and mushrooms. It was Jessica’s slow cooker pot roast only I did it in the oven because it is soooo cold here. I suggest you try it it was delicious. Breakfast was the same. We tend to eat the same breakfast on weekdays and have eggs for dinner sometimes or on the weekends. Dinner –Husband had the last of the lettuce with chopped raw veggies of his choice, chicken and a sprinkling of cheese. I ate the last of the leftover hamburger soup and a bread stick from the freezer.. I think what will work best for us is to cook a bunch of food at one time and eat it during the week. My husband takes his lunch to work everyday but I fill the containers and put them in the freezer and he takes one each day. I am not an eat as soon as I get up type so I eat my toast mid morning and rarely eat lunch. By having prepared food in the fridge and freezer I am making sure I eat dinner before I go to my very part time job 2 evenings a week and then I don’t eat late at night and then go to bed. Breakfast was my usual scrambled eggs and toast. Lunch was a sandwich with plenty of veggies. For dinner I finished off some leftover Mongolian “beef” over leftover barley couscous. Not sure what the BF had at all that day since we didn’t see each other until 9:15. It was our CSA pickup day, so I’ve got some extra root veggies and a new bag of spring mix. Hooray! I’m in too! Doing inventory this weekend. We’ve used up some pork from the freezer for Carnitas, pizza dough & red sauce. Will have to get produce and dairy this weekend. But not tomorrow it’s going to be too cold!! Brrr…..